We'll be back tomorrow for more international football as Wales take on Slovakia from 14:00 GMT. Scotland are then on the road against San Marino at 17:00 GMT, before Northern Ireland host Belarus at 19:45 GMT. Netherlands also host Germany in a mouth-watering tie at 19:45 GMT. We'll have live text coverage of all of those matches. So no major shocks in any of today's European qualifiers. If you missed it earlier, the Republic of Ireland ground out an unconvincing 1-0 win over Gibraltar in Mick McCarthy's first game back in charge. Switzerland beat Georgia 2-0 in the other game in Group D, while Malta, Sweden and now Spain all picked up 2-1 wins in Group F.
In Group J, Bosnia-Herzegovina beat Armenia 2-1, while Greece won 2-0 against Liechtenstein. Italy's 2-0 win over Finland was the other result in that group. The only result that seemed to go against the book today was Brazil's disappointing 1-1 draw with Panama in their international friendly in Porto. Peru, Guatemala and Mexico all won their friendlies elsewhere. Sergio Ramos' goal gives his country the victory. Joshua King plays a lovely ball in with the outside of his foot and Bjorn Johnsen's diving header flies inches wide of the keeper's right post. The flag goes up though - he was offside anyway. Sergio Ramos and Bjorn Johnsen have a clash of heads in the box and the Norwegian has to be strapped up by the medical staff. Both players are fine to carry on for the final few minutes. Marco Asensio should have put this game to bed when he's found unmarked in the box by a smart chip from substitute Jaime Mata. He only has to poke it either side of the keeper but shows too much arrogance, trying to get for a fancy chip. He gets it wrong, skewing it over the bar. A long-range shot is fumbled by Gianluigi Donnarumma and the keeper has to scramble to pick the ball up at the feet of Robin Lod. The Italian keeper isn't happy with Lod's apparently dangerous follow through and kicks off in the box, being held back by some of his defenders. Alvaro Morata hasn't been able to take his chances. Jaime Mata comes on in his place to run down the clock for a few minutes. Inigo Martinez does well to win the header under pressure from Bjorn Johnsen but hurts himself in the process. After a few rubs of his head, he's back on his feet. Nicolo Zaniolo replaces Marco Verratti, who has had another good game in midfield. Fabio Quagliarella smashes the corner of the crossbar and post with a fizzing strike from the right side of the box after he was played in by Federico Bernardeschi. Rasmus Karjalainen replaces Teemu Pukki. That was Sergio Ramos' ninth penalty of the season. He has scored five of them with a Panenka. Fabio Quagliarella's first act is to head inches wide from a Federico Bernardeschi cross. Off goes Ciro Immobile. On comes Fabio Quagliarella. Marco Asensio wriggles into the box and gains a yard of space to shoot with his left foot. It's a comfortable one for the keeper though, low at his near post. Sergio Ramos may be a goalscoring machine for a centre-back but he just showed why he's not a striker. The corner comes all the way through to the back post but he hesitates before volleying and ends up just touching it out of play. 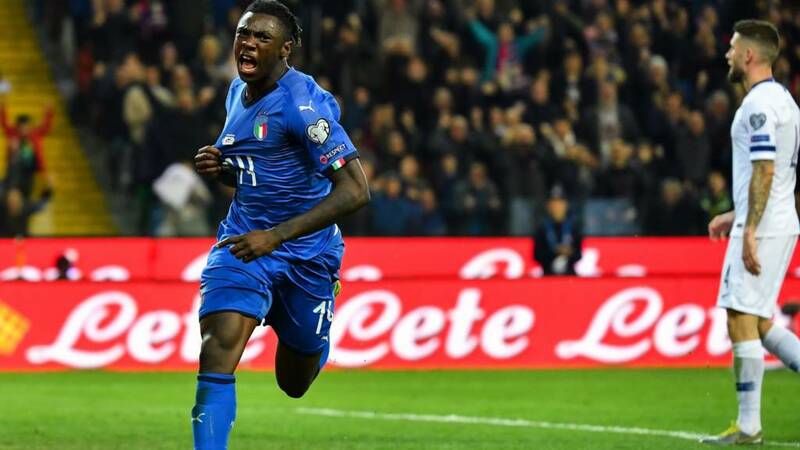 That's Moise Kean's first international goal on just his second appearance. He's some player. He's already bagged three goals in seven appearances for Juventus this season - including two in four Serie A games. The defence caves open as Ciro Immobile simply threads it through the two centre-halves and into the path of Moise Kean. The teenager shows his composure, waits for the right moment, and slots it past the keeper.